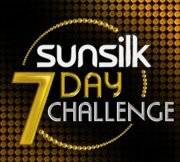 I just signed up for the Sunsilk 7 Day Challenge and am looking forward to trying their products out. I have very thick, curly hair that isn’t very healthy lately. As soon as I complete the 7 Day Challenge, I will post a review & let you know if it helps my hair become healthier. Don’t want to wait for my review – try it for yourself. To get the free Sunsilk 7 day challenge kit and get every inch perfect hair, take the challenge.